The site of Chedi Phra Sri Suriyothai was first established as Wat Sopsawan by King Maha Chakkraphat to honour the queen who died defending him in battle. The most prominent female figure to emerge from Ayutthayan history, Suriyothai was a queen during the 16th century when war was commonplace in the region. In a battle on elephant back during the Burmese-Siamese War of 1548, she was supposedly slain while attempting to defend the king near Ayutthaya. 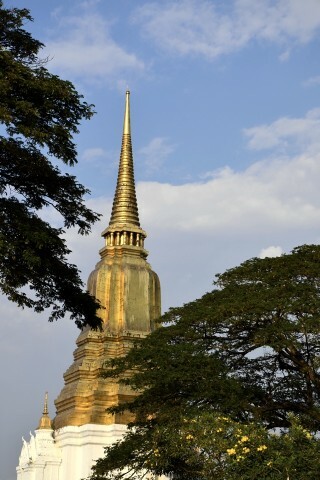 Topped by a slender spire, the gold-painted chedi rises from a four-sided white base and towers atop broad trees in a park across the road from the Chao Phraya River. Following a push by King Rama V to identify the geographical locations of important places mentioned in Ayutthaya’s Royal Chronicle, the chedi was built in the late 19th century on the spot where Queen Suriyothai is though to have been cremated. While the chedi won’t knock your socks off, it does twinkle in the late-afternoon light and the small Sri Suriyothai Park that surrounds it is filled with gardens, gazebos and shady trees. It makes for a pleasant pit stop if you’re cycling through the quiet western reaches of the island, perhaps while checking out other low-key attractions like Wat Lokkayasutharam and the Pridi Panomyong Memorial. To see a life-size statue of the queen looking tough on a war elephant, head to the larger park surrounding the Queen Suriyothai Monument (not to be confused with the chedi), located across the river in the far northwest corner of town, a bit north of Chedi Phu Khao Thong. Chedi Phra Sri Suriyothai is located off Uthong Rd on the far western end of the island.